Every Women's Guide to Optimal Breast Care. The book addresses the many controversies in breast health and explains what women must do to obtain the best care possible. It is the same advice I would give to my wife or daughter. A doctor’s practical guide to preventative breast cancer care, challenging accepted thoughts and breaking down common misconceptions and confusion about breast health. A general surgeon by training and a pioneer in the development of regional trauma systems, DR. JOHN G. WEST became fascinated with the multidisciplinary team approach to breast cancer care in the mid 1980s. He opened Orange County’s first breast care center in 1988, and over the past 20 years has been on the cutting edge of developing a team approach to the care of patients with breast problems. He was cofounder and chairman of the board of the Breast Health Awareness Foundation, which is a community outreach program dedicated to the early detection of breast cancer. Dr. West has been named a Best Doctor in America and has been recognized as one of the “Best Doctors in Orange County.” He has been the lead author in 20 peer review articles and has written two previous books. Residence: Orange, Calif.
"Dr. West's book is a valuable addition to the current literature for those touched by breast cancer. He has dedicated his career to caring and healing women with breast cancer, which he reveals with knowledge and passion in this excellent book." 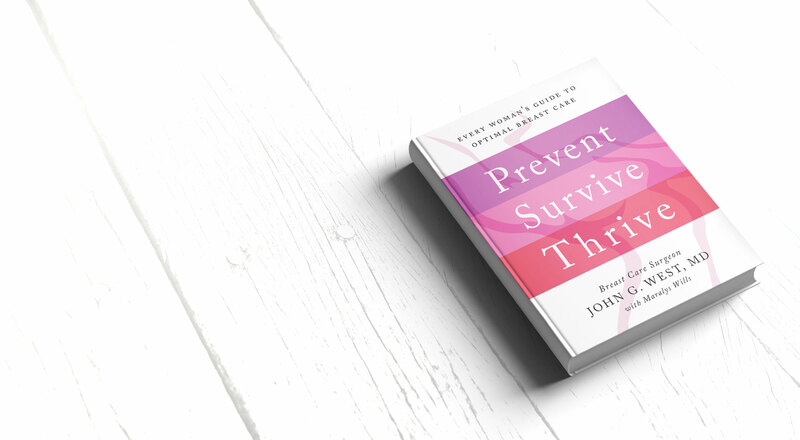 "Prevent, Survive, Thrive continues Dr. John West's longstanding message of empowerment to those facing or in fear of breast cancer. This literary gift moves from prevention to survivorship to activism in sharing pearls of wisdom that transform us from victims to victors! This book is a wellspring of knowledge from a breast health leader who is a living legend in the fight against breast cancer. I am truly blessed to have witnessed John lead a breast health movement from his base in Orange County, California, to a national level." "I wish I'd had this book at my fingertips years ago, but I am truly grateful for its publication at this time for the sake of my friends and family, as well as all women, both younger and older. Told in a blend of decadesrich expertise and personal case studies, this book provides a way to wrap your head around a woman's most dreaded health worry. Prevent, Survive, Thrive: Every Woman's Guide to Optimal Breast Care helps you sort through often conflicting reports and find your way to making better decisions." "Dr. West has shared his extensive experience in this uniquely comprehensive and easyto- read treatise on all aspects of breast care for women of all ages (teens through seniors) and their loved ones, allowing them to be diligent in making decisions and their own choices regarding the ever-evolving questions of controversy and myth about breast cancer diagnostic alternatives and treatments. With the book's information on new technologies and multiple case histories, a patient can and should feel in charge of her own breast health plan in coordination with her chosen expert medical professionals." "If you never want to hear the words, 'You have breast cancer,' this book is for you. You won't need a second opinion to decide whether to buy Prevent, Survive, Thrive. This book truly is, as it says on the cover, Every Woman's Guide to Optimal Breast Care. It helps you navigate confusing medical jargon and separates facts from the media buzz. There are plenty of books on facing the diagnosis of breast cancer, but this book, with its accurate straight-talk information, practical tips, and survivor stories filled with hope, helps you to prevent breast cancer. Every woman with breasts needs to read this book, and don't say this because it's funny. I say this because it's true." Thank you for sharing your incredible book with me. I think it is a must read for all Women. The style of the book reads like a personal conversation between you and the reader, which makes for an easy read. You explain all the facts and treatments, giving women the pros and cons. The scientific details are all laid out, but in layman's terms. Although much of the information is in layman's terms, you never talk down to your reader, treating her as an intelligent capable woman who can take charge of her own healthcare. © 2018 PREVENT, SURVIVE, THRIVE | All rights reserved. Unauthorized use is strictly prohibited.